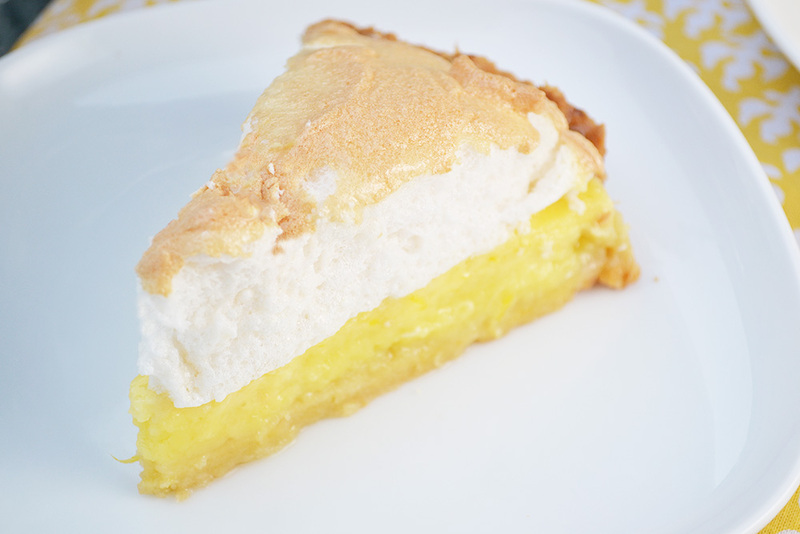 When was the last time you went to a diner and had a slice of classic lemon meringue pie? 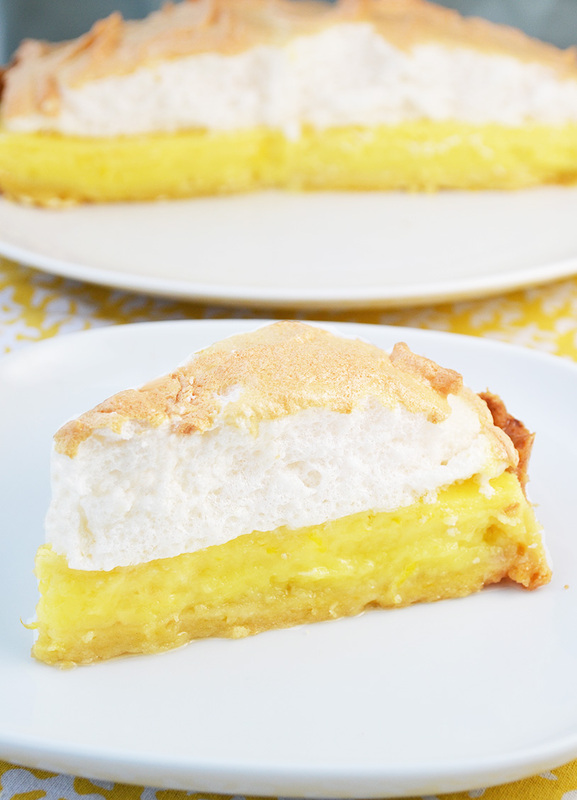 The sugary lemon filling topped with mile-high meringue is a somewhat satisfying end to that all-American diner meal, usually consisting of french fries and something sandwiched. Often mediocre and overwhelmingly sweet, lemon meringue pie can easily be improved upon through a homemade version…or in this case, a French-American hybrid. So many great dishes and techniques have come from French cooking and baking. This became obvious to me in culinary school, where I was taught the basics of cooking and pastry through the use of many French terms, such as blanchir and nappe. One of the desserts I learned and had to repeat until near perfection, was Tarte au Citron. This simple French lemon tart required basic but essential pastry techniques and of course, the results were tasty. The lemon filling is what really made me a fan: it was tart. I know what you’re thinking, so what? Shouldn’t a lemon filling always be tart?! Yes, it should but it usually isn’t. Lemon fillings are more often than not, sugary sweet with a hint of lemon instead of boldly tart, borderline sour, with just the right balance of sweetness. This recipe utilizes a version of this tart lemon filling from that classic Tarte au Citron recipe but is also combined with my grandmother’s amazing tart pastry dough and topped with fluffy sweet meringue. It utilizes the best of the best and though my photos may not do it justice (yes, I let the meringue brown a touch too long and the slices aren’t picture perfect smooth and pointed…these things happen! ), this is one tasty tart. The hard boiled egg yolks in my grandmother’s recipe for the tart pastry dough, provide a richness that pairs well with the flavorful tart lemon filling. Billowy meringue adds that sugary light sweetness and fluffy texture that balances each mouthful of luscious lemony cream and buttery crust. After tasting this heavenly tart, you may never be able to eat that one-note diner lemon meringue pie ever again. Note: to make pastry that is less fragile and crisper in texture, substitute two egg whites for raw egg yolks. Grease a 9-inch tart ring and place on a baking sheet lined with parchment paper. Roll pastry dough an 1/8 inch thick and line tart ring. Chill. Preheat oven to 350 degrees. Place chilled pastry in oven, taking it directly from freezer or refrigerator so it is as cold as possible. Place wax paper or tin foil in tart shell and fill with pie weights or dried beans. Remove pie weights after 10 minutes to allow the bottom to bake. If sides of pastry should sink down during first 10 minutes of baking, simply press them back with a fork. Bake for a total of 25 minutes, or until shell is golden brown. Remove and cool. Zest lemons and squeeze the juice into a small bowl. In a medium size mixing bowl, whisk eggs and sugar together until mixture is well blended. Mix in cream. Whisk in lemon juice and zest. Skim any foam off the top. Pour filling into cooled tart shell. Place the tart in the oven and bake 25-30 minutes until the center of the tart no longer appears liquid and just lightly jiggles when the tart is moved. Remove and cool completely. Place egg whites and cream of tartar in the bowl of a stand mixer fitted with the whisk attachment. Beat egg whites until soft peaks form and then add vanilla and gradually add sugar, continuing to beat until stiff peaks form, approximately 1 to 2 minutes. Pipe or spread meringue over filling. Raise oven heat to 375 degrees and place tart in oven until meringue is golden (about 5-10 minutes). Cool.